In Tallahassee, the rumblings to oust the legendary Bobby Bowden have become much louder. In Gainesville, Gator Nation patiently waits the status of Tim Tebow as the Tigers of Baton Rouge await them. In Miami, a 3-1 start is sounding the alarm to the ACC, the Hurricanes are back! As architects go, not many have built what Bobby Bowden has. Building a football program from the ground up, the Florida State head coach has raised national championships, coached up Heisman Trophy winners, and in the words of the late Frank Sinatra, done it his way. However, in his thirty-third year at the helm of the Florida State Seminoles, Bobby Bowden is under pressure to call it quits after this season. A program in decline for several seasons, Florida State has ran into rough times. Lack of premier speed at the skill positions, a slew of average college quarterbacks, the Seminoles have become just that; average. Long gone are days of fourteen straight top five finishes in the AP poll from 1987-2000. Long gone are the days of Peter Warrick, Warrick Dunn and Charlie Ward. Now the Seminoles march out the likes of Christian Ponder (14 TD's & 13 INT's in 2008). As trustees and fans wish for a return to glory at Florida State and having the school gone so far as to name current offensive coordinator, Jimbo Fisher, the head coach in waiting, Bowden's days are numbered. For a coach who once ruled football in the state of Florida and currently roams the sidelines of a field named after him, this is not the way he wishes to go out. Amidst clouds of academic scandal, being called out by school officials, and having his worst coaching start since his first season at Florida State, Bobby Bowden may have lost the option. One way or another, and it seems so evident, Bowden & Florida State will be calling quits sooner than anticipated. How vulnerable can the #1 team in the country be? We're about to find out. A 4-0 record, outscoring opponents 182-29, what could go wrong? If this was jeopardy I'd answer it like this: What is a bone crushing, night over, hit to Heisman Trophy winning quarterback Tim Tebow? I'd be right on the money. With Tim Tebow's status unknown, the Gators could be walking into a real life buzz saw in the form of the Bayou Bengals. The undefeated, ranked 4th in the country, LSU Tigers, would be going a long way if they were to knock off Florida on Saturday night. Like the two losses Oklahoma has suffered after watching their Heisman winning quarterback go down, they still stick. 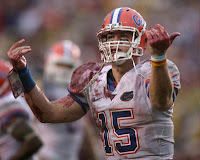 While the decision to play Tebow will be left up to medical professionals, the Gators have much at stake this week. A possible shot at their third National Championship in four years. Tim Tebow's shot at another Heisman Trophy, placing him alongside only Archie Griffin. An undefeated record which would help to assure them championship game invite. If anyone is going to convince doctors and Urban Meyer alike that they are indeed ready to go, it's Tim Tebow. The Gators most difficult game remaining on their schedule will sure be interesting. If Tebow sits, LSU will be sure to rattle his rookie understudy, if Tebow returns I'm sure the Tigers will be looking to put a lick on the Heisman winning quarterback. My call? Tebow sits. A concussion is nothing to be taken lightly. John Brantley, tred lightly, keys are in your hand. The "U" is relevant, again. The 11th ranked Miami Hurricanes are making noise. A 3-1 start with victories against Georgia Tech, Florida State, and Oklahoma has put Miami right back on the map. While the 'Canes will need some help to win the ACC (last weeks loss to Virginia Tech was huge), they've certainly turned things around. In the coming months Miami will play out the remainder of the their ACC schedule and make a push toward the top ten and a big time bowl game. Sophomore quarterback Jacory Harris has had his growing pains in the last two weeks, however his 19-28 for 202 yards and three touchdown performance against the Sooners put his Hurricanes in prefect position to steal a huge win against a ranked opponent. The dual rushing attack from Javarris James and Greg Cooper (5.4 yards per carry) has kept defenses on their toes and added even more weapons to an offense averaging 30 points a game through four. While opening witht he likes of FSU, Ga. Tech, Va. Tech, and Oklahoma, now comes the tough part. Each of the last three seasons, Miami has rounded out the season in terrible fashion. In 2006, the Hurricanes finished the season winning just 1 of their final 5 games. In 2007, (after a similar 4-1 start) Miami fell short losing 6 of their final seven outings. Last season, 2008, the 'Canes dropped their final three games including their bowl game against California. If Miami is going to make the next step, head coach Randy Shannon needs to get these guys to play up for everyone not just the ranked opponents. For Miami fans, things are about to get way more exciting, the question will remain, how excting can they get? Forget California and Texas, football in The Sunshine State has more drama than an episode of The Real World. For the remainder of this season I'll have my eyes on one state; Florida.